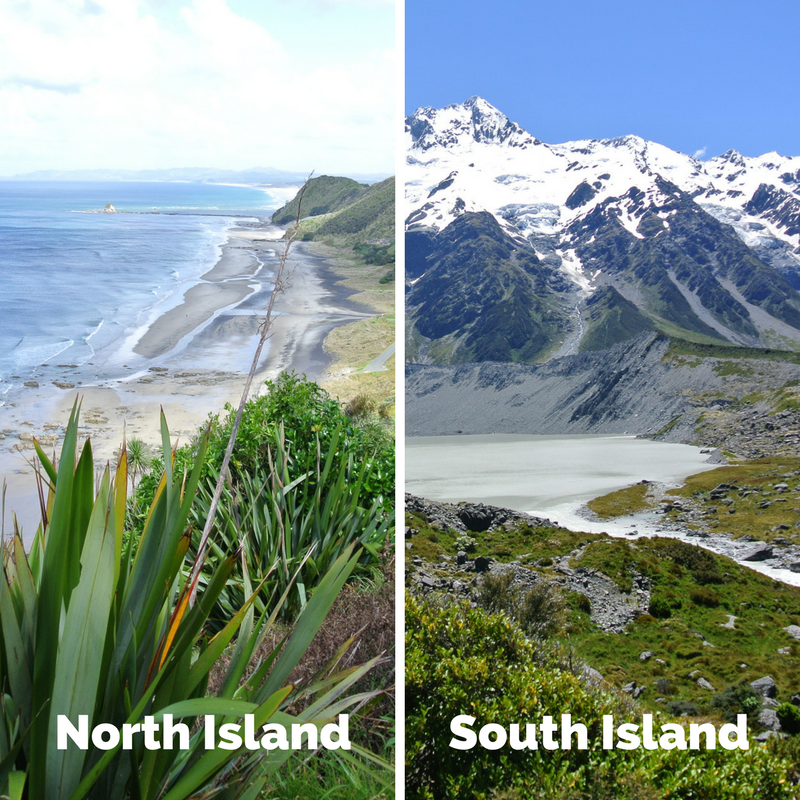 The North Island and the South Island of New Zealand are very different from each other. Some prefer the warmer North, where you have beautiful beaches. Others prefer the South, with glaciers and impressive mountains. I get a lot of questions from people who only have a short amount of time to travel the country. They ask me which of the two islands they should visit. I haven’t spend enough time on the North Island yet, to be able to have a strong opinion. I’m really really curious which Island is the most popular among travellers, especially backpackers. If you had to choose between visiting one of both islands, which one would it be? Which island in New Zealand do you prefer, for traveling? Thank you for voting, I really appreciate it! I’m looking forward to see the result. If you want to make a comment, scroll down below. Before I had my burn out, I was a perfectionist. I had to be able to do anything with full dedication and perfection. I couldn’t say no. I didn’t pay attention to how I was feeling. Payed no attention to my body. I just kept on going.. From one job to the other, to school in the evening, to heaps of social events and obligations in between, and lots of physical exercise. I thought I was really happy. The result was a burn out. The last couple of years, thanks to my ADHD-therapists, a Mindfulness course and a course about assertiveness, I kind of learned to listen to my body and to myself. To how I feel, to what I really want. I say ‘kind of’ because sometimes, old habits die hard, like what happened to me during this hike. 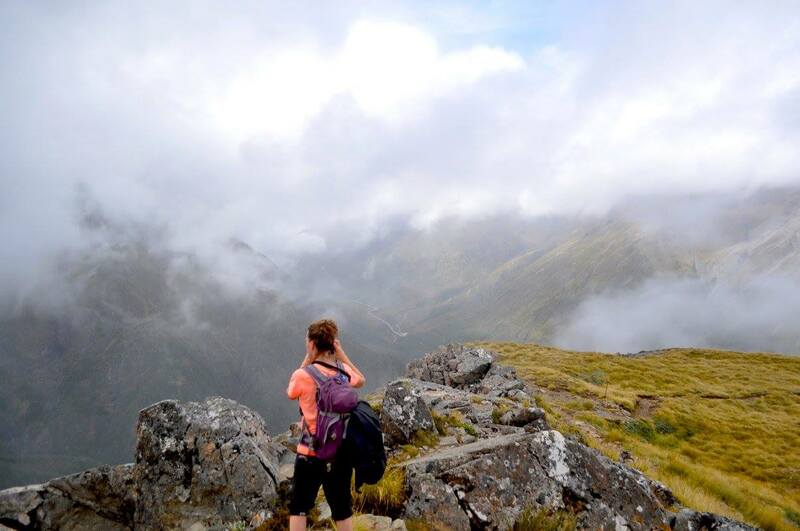 If you go to New Zealand and you love to do a great, challenging 1-day hike, you have to do the Avalange Peak in Arthurs Pass. Amazing! This hike is categorised by DOC as Expert: Route. This means you have to have high level backcountry skills and experience. Navigation and survival skills are required, as well as complete self sufficiency. To be honest.. I do not fit into this category. I’m reasonably fit, but I have none of the skills mentioned above. When we went on this hike (on February 2017, sun/clouds/rain), we brought food for one day, warm, waterproof clothes (layers! ), drinking water. That was it… Not completely self sufficient, right? Luckily I can tell you how it ends: we survived (so if you are bored, you can stop reading now;)). I did this hike with Oriane, a professional athlete. She was living in New Zealand for a couple of months to participate at the Rowing Nationals in Twizel. This means, she was training 2 or 3 times a day, 6/7 days a week, for months. Imagine her level of fitness. HELP. We started a 5-day trip only one day after she won some medals during the Nationals. This girl is fit. I mean.. she told me she was exhausted from the Nationals. But still.. I was in for a treat. On our first day, we arrived in Arthurs Pass (where the track starts) around 1pm. We went to the I-centre/DOC (which is where you want to go when hiking in New Zealand) to see what hiking tracks we could do. She took 1 look at the information board and she instantly knew. We were going to do Avalange Peak, a 7-8 hours walk up the mountain. My first respons was: It’s already 1pm.. are you serious? Don’t argue with a rower. So… I didn’t agree with Oriane in the beginning. I was exited about this track, but I really wanted to do it the next morning. Starting a challenging hike that will take at least 6 hours after 1pm.. no way. But Oriane said ‘No, don’t worry. We are fit. We can do that in 5 hours’. So… When you go hiking in New Zealand and you like a challenge, do this track! Avalanche Peak is the only peak in Arthur’s Pass that is marked by a poled route to the summit. The climb is 1,100 m vertical from the village (over just 2.5 km horizontal), and on a fine day, you will be rewarded with grand views of the surrounding peaks. Dying for the view? Be safe! DOC says: ‘Many people have enjoyed this mountain-top trip with panoramic views of the Southern Alps/Kā Tiritiri o te Moana. However, some people have died on this extremely steep and rocky journey to the top of an 1833 m peak‘. If you want to stop reading now because you think you can’t do this, don’t! When the weather is good, and you are reasonably fit, you can do it. We crossed one person during this hike wearing Vans (by accident, but still…). Don’t worry too much, this track is awesome and doable. Especially when the weather is good. Wow, this track is awesome! From the start, you face a nice steady climb until you reach the bush line. If you like flat tracks, this is not your track. There’s literally no flat part, you’re climbing continuously. When we started, the weather was good. A bit cloudy, but luckily we still got some awesome views. We were going fast (Oriane took the lead and I didn’t want to give in to my ‘weakness’, so I kept on going). We were talking about the movie Touching the Void, about two climbers surviving a nearly fatal climb in the Peruvian Andes. We talked about how we (humans) are capable of way more then we think we are (physically). Oriane told me how she trained her mind to ‘not feel’ pain and exhaustion. When you are an athlete and you’re goal is ultimate performance, you have to. I just learned, from my burn out, that it is important to listen to your body. This was a contradiction. I wanted to be strong, I didn’t want to ‘complain’ or slow her down, I didn’t want to feel week. But I should have listened to my body, because after 1,5 hours running up the mountain, I was exhausted already. We weren’t even halfway there. How do you decide to keep on going or to go back? It was getting late. For the next hours, we asked all the people that were walking down, how far we were from the top. The clock was ticking (we wanted to be back before it got dark). Literally everybody said ‘ehhhhh… maybe an hour?’. At the beginning, we were happy. “oooh, just one more hour”, but after 1,5 our, or 2 hours, it got really annoying. I was exhausted, but I really wanted to reach the top. I didn’t wanted to screw it up for Oriane (and myself). It started to rain, and the view was starting to disappear. When you are hiking in New Zealand, make sure you bring enough warm clothes. The country is famous for it’s ‘4 seasons in one day’. It’s good to wear layers. We really, really wanted to make it to the top. But it was getting late. And it was harder and harder to see the route. When we passed to bush line (that was a huge relief), it was getting harder and harder to see where we had to go. Where it was walking before, it started to look more like climbing. We were climbing over big boulders, which made it challenging and fun. Though I was exhausted for almost the whole track, it was an unforgettable experience, especially the climbing part. The visibility was decreasing, but we were still determent to reach the top. We just had to follow the poles. The last part is tough (but fun) and can be dangerous when the weather is bad. It’s a narrow ledge made out of boulders. For me, this was the most fun part. I felt like being a kid again, climbing in trees. I was completely worn out, and I didn’t care. After a while.. we could see it… the top! We made it. It was 5pm and we made it! Oriane kept saying that the way down was going to be harder. Luckily, for me it wasn’t. I mean, it wasn’t easy. I was still exhausted, but it wasn’t as hard as the climb. It was still raining, and it was getting a bit cold, but we didn’t care. around 6.30pm we arrived at the van. WE MADE IT! We were totally wet and sweaty and decided to take a shower in the river. The water was freezing (came directly from the mountain), but it was awesome! A great energy-boost, and we felt all clean again. Having a burn out twice, that doesn’t happen, right? Although it was an amazing experience, I would do it a little bit different next time. The days after the hike, I had sore muscles. Not just a little bit, no, a lot. I was completely worn out, had no energy for a couple of days. I didn’t enjoy the next hikes as much as I would like to, because I was exhausted. Hiking made me nauseous for at least 4 days. When I heard of people having a burn out twice, I always had kind of a judgement about that. How can you let that happen twice? Don’t you learn anything? In the Netherlands we would say ‘it’s the nature of the animal’. Though you can learn a lot from your burn out, like taking care of yourself and listening to your body, your personality stays the same. I will always be a bit competitive. I wouldn’t give in quickly. I will continue searching for my limits.